AUSTIN — Today Texas Land Commissioner George P. Bush announced he sent a letter to President Donald J. Trump requesting help getting rules for Texas' Community Development Block Grants for Disaster Recovery (CDBG-DR) mitigation funding approved by the Department of Housing and Urban Development (HUD) and the Office of Management and Budget (OMB). It has been nearly a year since the funding was appropriated by Congress. "Mitigation should be a top priority to prevent future damage from hurricanes and storms while maximizing the use of recovery dollars, yet the federal bureaucracy is slowing recovery in Texas," said Commissioner Bush. "This continued delay is resulting in homeowner distress, community degradation and increased costs to the federal government due to subsequent damaging events. This is unacceptable. I need your help to cut through the red tape and call on HUD and OMB to publish the rules governing the $4.383 billion appropriated to Texas immediately." 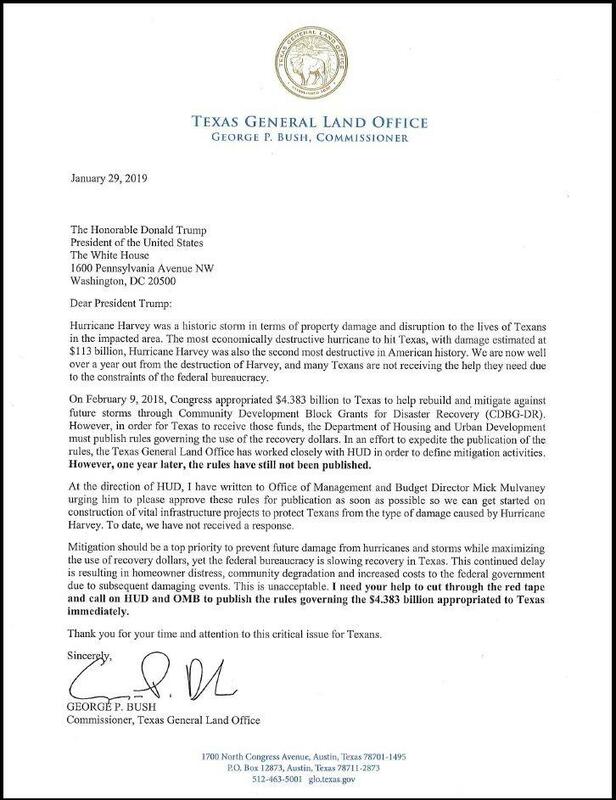 In the letter, Commissioner Bush tells President Trump that Congress appropriated $4.383 billion to Texas to help rebuild and mitigate against future storms through Community Development Block Grants for Disaster Recovery (CDBG-DR) on February 9, 2018, nearly one year ago. In order for Texas to receive these funds, HUD must publish rules governing the use of the recovery dollars in the Federal Register, which enables the Texas General Land Office (GLO) to move forward drafting the state's action plan. Once the state action plan has been drafted and made available in multiple languages for a mandatory public comment period, it is then sent to HUD for approval. The federally mandated State Action Plan process takes a minimum of four months and has taken longer than six months in many cases. Commissioner Bush also notified President Trump that, in an effort to expedite the publication of the rules, the GLO has worked closely with HUD in order to define mitigation activities. However, one year later, the rules have still not been published. Commissioner Bush wrote to Director Mulvaney regarding approving HUD's rules on Jan. 2, 2019. "At the direction of HUD, I have written to Office of Management and Budget Director Mick Mulvaney urging him to please approve these rules for publication as soon as possible so we can get started on construction of vital infrastructure projects to protect Texans from the type of damage caused by Hurricane Harvey," said Commissioner Bush. "To date, we have not received a response." Hurricane Harvey was a historic storm in terms of property damage and disruption to the lives of Texans in the impacted area. The most economically destructive hurricane to hit Texas, with damage estimated at $113 billion, Hurricane Harvey was also the second most destructive in American history. As Commissioner Bush reiterated, it is now well over a year out from the destruction of Harvey, and many Texans are not receiving the help they need due to the constraints of the federal bureaucracy. The next hurricane season is set to begin June 1, 2019.